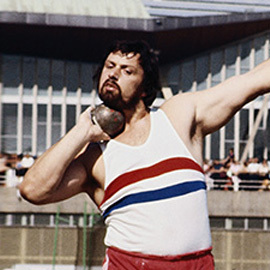 At one time the strongest man in the world, shot putter and Olympic speaker Geoff Capes has won gold, silver and bronze medals in some of the toughest competitions on planet Earth. These include gold medals in the 1974 and 1978 Commonwealth Games and in the 1974 and 1976 European Indoor Championships . Geoff’s three silvers all came in the indoor competition, as did one of his bronzes. His other bronze medal was won at the European Athletics Championships. As well as taking part in mainstream athletics events, Olympic speaker, former labourer and police constable Capes was a professional Highland Games competitor, winning it several times and setting many world records. Having won in 1981 and 1983 he then won for the following four years, meaning he was the event’s most successful athlete ever. Other noteworthy titles for Geoff include the World’s Strongest Man, which he won twice, the World Muscle Power champion (again, twice), Europe’s Strongest Man and Britain’s Strongest Man . After he retired from competitive sport, Capes ran his own sportswear shop, bred birds, and spent some time as a referee and coach. To book leading Olympic speaker, Geoff Capes, to make a personal appearance at your corporate event, function or conference, simply contact the Champions Olympic Speakers agency by filling in our online contact form. Alternatively, call a booking agent directly on +44 1509 85 29 27.